The Farr Out Family: I've Got a Green Thumb! I've Got a Green Thumb! With spring quickly approaching we decided to exercise eminent domain and steal some of my Grandparent's yard to plant a garden. This is the portion which we stole from them. 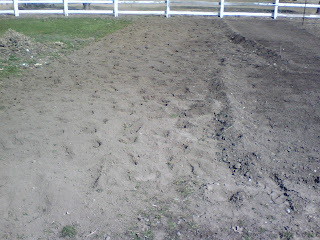 Today we spent a couple of hours rototilling the ground and getting the soil already. 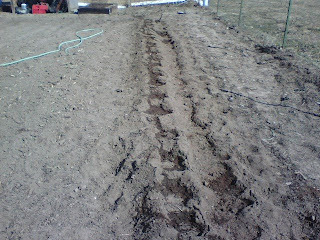 Then we planted 25 strawberry plants (Lori wanted 4) in addition to the 24 that my Grandpa planted. So if anybody needs strawberrys in a few months let us know.